A Japanese proverb, “登らぬ馬鹿、二度登る馬鹿” suggests that you would be a fool not to climb Mount Fuji once—but a fool to do so twice. Climbing to the summit of Mount Fuji is certainly not an easy hike, but it is definitely a challenge that any healthy adult should try and can accomplish. A few of my friends from Hiroshima University and I followed the advice of the Japanese proverb, and we decided to climb to the summit of Mount Fuji during the summer of 2013. Our plan was to leave from the base during the evening and arrive at the summit before sunrise. Since Mount Fuji was named a UNESCO World Heritage Site, the number of climbers has increased by at least 35%. This made the final part of our ascent arduous. The final 500 meters of the climb required us to wait in long lines with other climbers, with little separation between the people in front or behind. You waited around 1-2 minutes before you could even take your next few steps. The wait was more exhausting than the actual climb. At one point, we were even worried that we would not be able to arrive at the summit by sunrise. Fortunately, with each other’s support, we were able to make it to the top on time. Climbing Mount Fuji for the first time will always be something you will never forget. Watching the majestic view at the summit, as the sun rises above the horizon, does give you a sense of satisfaction and accomplishment. But more importantly, you will never forget and forever share a lasting memory with the people whom you climbed the mountain with. Would I call someone a fool for never climbing Mount Fuji? No—but I would say it would be foolish to climb Mount Fuji without a great group of friends to share the experience with. 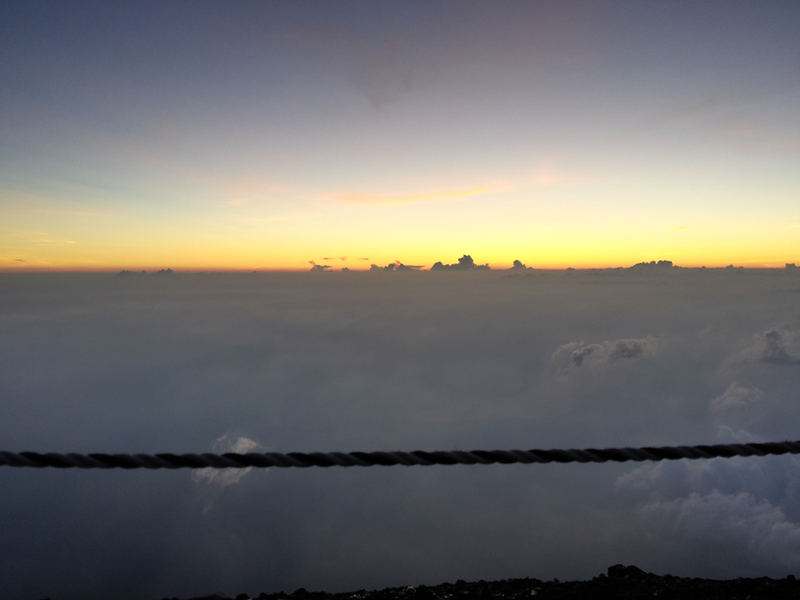 A view of the sky from the summit of Mount Fuji.